An evening bat in hand. Image: Enwebb, Wikimedia Commons, Share Alike 4.0 International license. Michigan has a new nocturnal visitor that might be here to stay. In recent years, the evening bat has been laying down roots in the mitten state. The bat-killing fungus White Nose Syndrome started the process – and climate change sealed the deal, said Giorgia Auteri, a University of Michigan wildlife researcher. Evening bats are resistant to White Nose Syndrome and might have begun expanding northward to use the food and shelter surrendered by other bats that the fungus killed, Auteri said. The evening bat looks a lot like any other bat – often, it’s mistaken for a young big brown bat. The two species share leathery black wings, doglike muzzles, and coffee-brown fur. But they have crucial differences: evening bats are smaller, have rounder ears and fewer sharp teeth than their big brown cousins. And until recently evening bats weren’t found in Michigan. It’s a traditionally a southern species, according to Eastern Michigan University bat biologist Allen Kurta. Evening bats recorded as far north as lower Michigan were rarities — misfits and lost migrants. Should Michigan be concerned for its native nightflyers with a new bat in the sky? 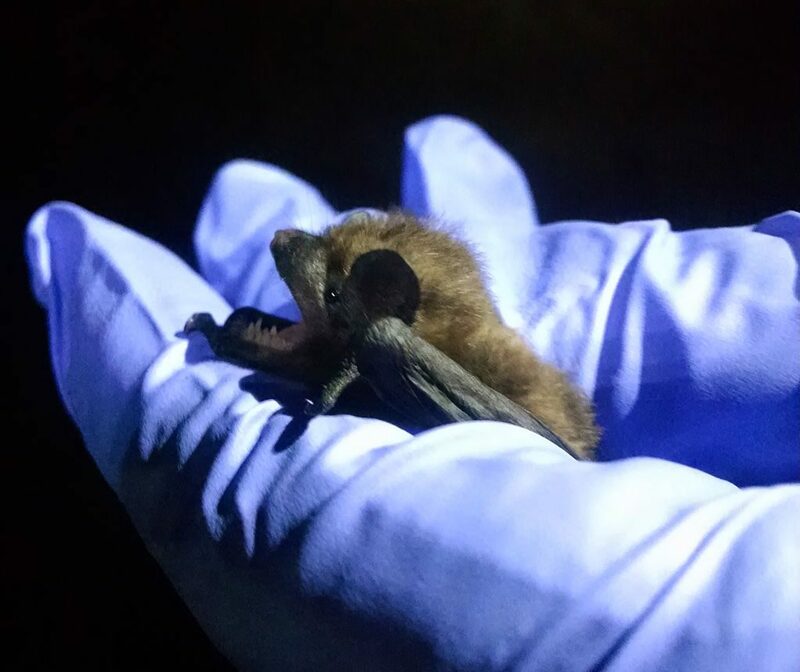 “The most common bats in (Southern Lower Michigan) are red bats and big brown bats, but evening bats are not likely to compete with either because of differences in body size or prey preferences,” he wrote in an email. Bats native to Michigan are also native to southern states like Tennessee and Alabama, where the evening bat is commonplace. The evening bat might even be good news for Michigan agriculture. In Lenawee County, a colony of them dined on spotted cucumber beetles and green stink bugs, “two of the most injurious pests to corn and soybean,” according to a study published in 2016 in The Great Lakes Entomologist. “Conservation and management of suitable bat habitat adjacent to agricultural lands would likely benefit farmers and bats alike,” the study concludes. The bats also eat moths, which can be crop pests as well, Auteri said.